With his smooth and quick gait, he made rapid work of his walk (in about 25 minutes; he was expected to take 35 to 40). Within the telecast, there were some images you will never again see for the first time, such as the one that heads this post. The imagery, and what he was achieving, was so inspiring that the footage made the hairs on my arms stand up. No question, this was an once-in-a-lifetime event seen by millions. As he progressed across, his repeatedly said, “thank you, Jesus,” and “praise be to you, God.” A born-again Christian, it was clear he used this running mantra to keep his mind focused on his task. And yet, he was so nonchalant that twice during the crossing he took interview questions from ABC reporters. Wallenda is not just a craftsman at his art, he is also a skilled promoter, and not just of himself. When he said, “To inspire the world,” he meant he wanted to inspire you to do whatever you love and are good at. I remember after the event getting into email discussions with friends about whether I would have been just as awed if he'd fallen (regardless of his tether), and I said yes. I remember thinking about what Dustin Hoffman said to his wife (a semi-retired dancer) many years ago. She had decided to return to dancing and had expressed fear of failure to him. He said, “If you fall, fall reaching.” She made her return and did not fail. As I said to my friends, better to go out doing what you are passionate and skilled at (as we discovered with that poor Toronto woman who died on Mount Everest last month, passion is not enough, skill is just as vital, if not more so) than to end your days slipping on soap in the bathtub, or sitting alone in your room being consumed by whatever illness is taking you out without ever achieving anything (be it raising a good family, or climbing mountains – it really doesn't matter – both are monumental achievements in my books). His achievement, done with cool confidence, love of family and strong belief system displayed last Friday night, was inspiring. 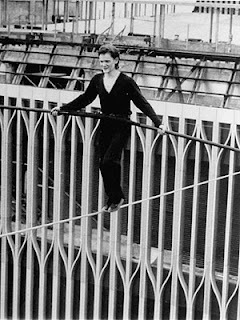 But as the weekend progressed, I started thinking about Philippe Petit, the rebel French wire walker who is justly famous for illegally wire walking between New York City's World Trade Center towers in 1974. None of his walks were as showy as Wallenda's, and his greatest achievement (the Trade Center walk) was not recorded on film. 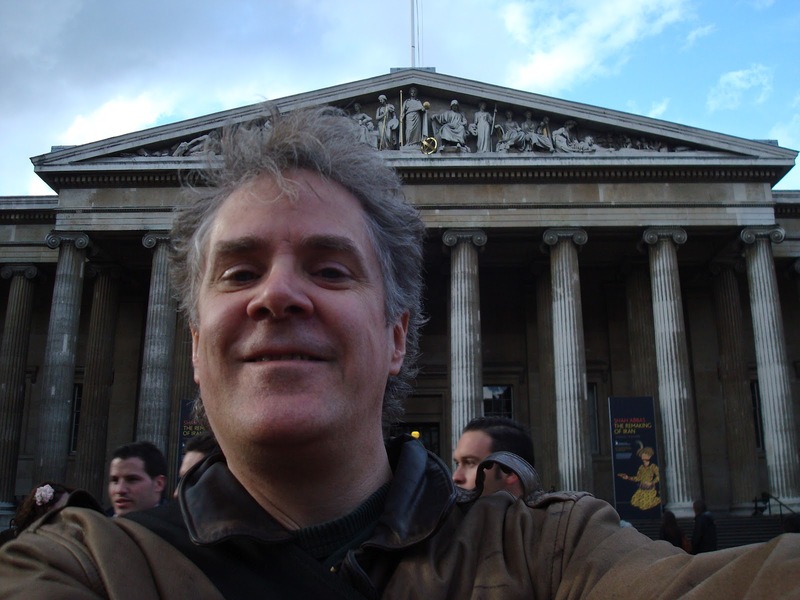 In fact, it only exists in the minds of the few witnesses (he started his walk at 6AM) and a handful of photographs taken. For him, it is not about doing the biggest, best or longest walk. To him it is not just craftsmanship, it is art. Where Wallenda merely walked across the wire – except for a brief kneel and bow, plus running the last 20 feet – Petit … well, let’s let a New York City cop comment from that time, “That wasn't wire walking; that was wire dancing.” This comment, and so much more, is in the superlative Oscar-winning documentary about Petit’s walk, Man on Wire (2008), which I re-watched this past weekend. For Petit, it is about passion, improvisation, tenacity and inspiration, so he not only walked back and forth between the two towers up to 8 times over 45 minutes (the number of times he went back and forth is disputed), he played with the cops trying to pluck him off the wire, pirouetting away, running the other way, coming back again, teasing and taunting them. He also sat and lay down on the wire in the middle to spend moments feeling the energy of the universe pouring into him as he drank in the sensation of what he was doing. His entire life is lived as an artist (he made his living as a street juggler in Paris between wire stunts around the world – he also illegally walked between the two towers of Notre Dame Cathedral, in Paris; and the two upper pylons of Sydney Harbour Bridge in Sydney, Australia). When he is interviewed in Man on Wire, he is manic and fast-talking, and yet when he's on the wire (in footage that he and his friends shot during training before his big walk) his manic nature vanishes and his face takes on, as described in the film, “the look of the Sphinx.” His focus is outstanding. It is like he is no longer there, all he sees is, well who knows what he sees, since he never really says. And yet, none of this is to denigrate Wallenda. In fact, I think the two men's approach shows that there is room in all professions and all walks of life for the accomplished craftsman and the committed artist. As I watched the two of them over the weekend (besides Wallenda's televised walk and Man on Wire, I also watched a TED.com speech that Petit gave in March of this year), I realized that they were like Gene Kelly and Fred Astaire. Wallenda is Kelly, an athletic technician who danced beautifully, but he always looked a bit workman-like; Petit is Astaire, where innovation and inspiration naturally came together to create works of art on a dance floor or ceiling (or in Petit’s case, a five-centimetre wire). Long may both continue to pursue their passions and inspire us lesser mortals to unearth more of our own. Petit had fun. Wallenda made it with willpower. this is a lovely article. totally different styles, mindsets, approaches. philippe is art, nik is a feat accomplished. totally different physical presence and presentation on the wire. totally different contexts (philippe is always starkly philippe, nik has an entourage, the family part of which is actually quite moving but also distracting). philippe had planned the Canyon Walk in 2000; it was rigged and ready to go and the producers backed out at the last minute, fearing a televised accident. no one has pointed this out as Nik did his canyon walk yesterday, with commentators saying things like "which no other human has dreamed of." read the New Yorker article by Calvin Tomkins, and Debra Winger's tribute in her book. Thank you so much for articulating what I was feeling on some level after watching Wallenda yesterday. For some reason I felt...."dirty" is the only word I can come up with....after watching the SkyWire event. All hype and promotion and...blather. And I must say that Nik's constant "prayer" was quite off-putting. It all felt like a stunt. Petit, on the other hand, as you point out, seemed more...inspiring. I felt exhilarated after watching "Man on Wire", but "conned", somehow, after watching "SkyWire"
Totally agree. 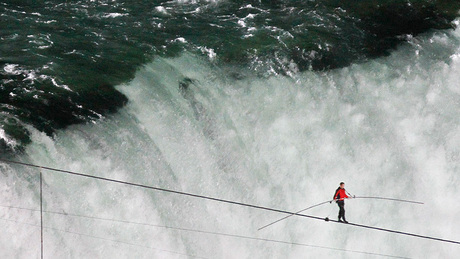 I'm surprised Wallenda wasn't covered in company logos like an F1 car. Artless. This is a wonderful article and expresses exactly how I feel, having recently rewatched "Man on Wire." 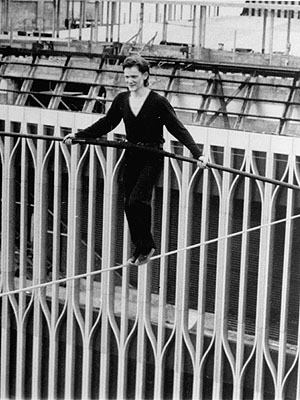 What Nik Wallenda did is a phenomenal and obviously grueling achievement and yet Philippe Petit's walk had a lightness, humor and beauty. I agree with Scott. While I respect both men, I admire Petit for the joy and inspiration he is unable to contain, for his walks, while Wallenda seemed to be praying just to make it across the gorge. 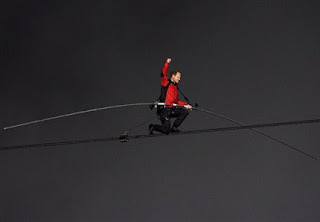 Where Petit was photographed smiling as he started his walk, at the pure joy of it, Wallenda seemed stressed and grateful to have made it to the other side. I guess I should comment. None of us know the men personally, so how are we to know how much joy Nik experiences when he walks the wire. What if his "prayers" are more of a praise to God for the gift of life and the gift of being able to follow his passion. Both men are amazing, no matter what their individual beliefs.